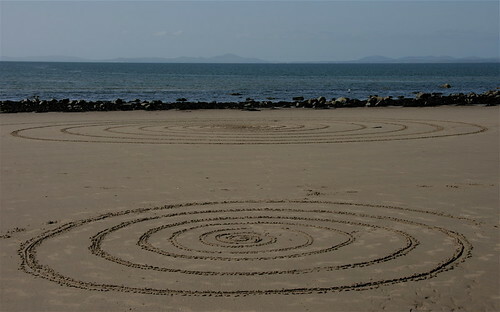 Unlike circles, in which we perceive stillness and completeness, spirals suggest dynamic movement springing out from a centre in ever-larger arcs. Spirals only end when a barrier interrupts their progress towards infinity: the hard casing of a shell, the top of a thermal, the edge of a sheet of paper. 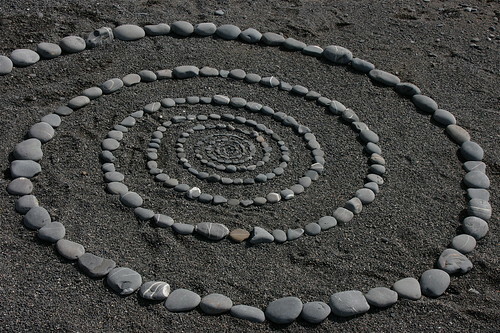 Making spirals is about encountering these barriers – stones too heavy to carry, the encroaching sea, or the edge of a beach. 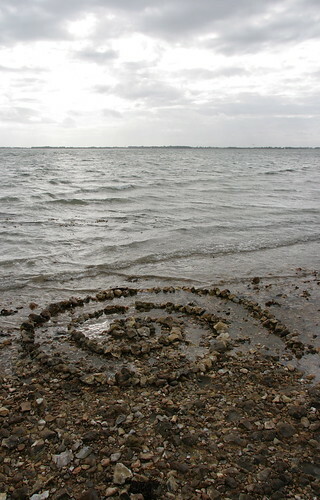 Spirals provoke reflection on limitations, in nature and in ourselves; we long for unimpeded movement but are all around confronted by enclosures of one kind or another. Perhaps it is why we often dream of flight, sailing up in spirals on a thermal as the falcon does so effortlessly.